Last week-end my husband went to St.Petersburg and was planning to see a good friend whose son turned 3 y.o. He also took our middle son Timothy along to have one-on-one time with him and give him an opportunity to visit the Hermitage. So good to be able to tailor a card for this occasion. The papers are DCWV. The number was stamped, cut out, covered with glossy accents and adhered after drying. 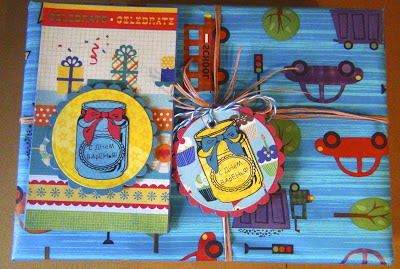 The cute stamp says "Happy Sweet Birthday" is by St.Pete scrapclub. I loved the card and made more just to have on hand for kids' parties during the coming year. A picture added. Later during the school year I had the cards on hand and made these cute packages. Wow, this is so Wonderful, Maria! As you know, I was there a few weeks ago in St. Petersburg! Seeing these photos of your son in the Hermitage Museum is such a thrill! I wish I had more time in Russia and that I could visit Moscow...it would be AMAZING to meet you, Maria! I am so glad that you stopped by my blog to say hi. You do such BEAUTIFUL work!